UNTIL recently this country was making headlines for all the wrong reasons. It was devastated by a brutal, decade-long civil war, which destroyed much of its infrastructure and displaced two million of its residents. Then it found itself at the epicentre of a global health emergency with the biggest ebola outbreak in history. Crime, civil unrest and disease are still rife in Sierra Leone, but it has found some unexpected good fortune — it’s suddenly become the world’s fastest-growing travel destination. That’s according to the United Nations World Tourism Organisation, which reports the West African nation welcomed a whopping 310 per cent more overseas visitors in 2016 compared to the previous year. According to figures in the UK’s The Telegraph, there were just 24,000 overseas arrivals in Sierra Leone in 2015. In 2016, that number swelled to 74,400. While it’s hardly the most visited spot in the world — Australia welcomed about 10 times that number of tourists in April alone — Sierra Leone is having a major popularity moment right now. It topped the UN’s list for fastest-growing travel destinations ahead of Nepal (which has seen a growth of 39.7 per cent), Iceland (33 per cent), South Korea (30.3 per cent) and the Eastern European nation of Moldova (28.6 per cent). The sudden spike in tourists arriving in Sierra Leone is likely due to the country being officially declared ebola-free by the World Health Organisation in March last year. And while it’s a place perhaps best known for blood diamond infamy, resource-rich Sierra Leone boasts plenty of wonders for tourists. It has stunning, white-sandy beaches and idyllic islands, including Banana Island and the Turtle Islands. It has one of the world’s largest natural harbours, as well as incredible savannas, rainforests — which are home to the elusive pygmy hippo — and glorious northern mountains. The capital, Freetown, is a energetic city with plenty of tourist attractions, including museums, the historic Cape Sierra Leone Lighthouse and houses on stilts, a legacy of the country’s history as a British colony. English, and English-based Creole, are among the main languages spoken. However, visitors to Sierra Leone should still tread with caution. Although the country’s bloody civil war ended in 2002, there is still the threat of civil instability and rates of crime are high, especially violent assault and armed theft, including in Freetown. Sierra Leone is now free of the ebola outbreak that claimed the lives of more than 4000 Sierra Leoneans alone. However, the country is still listed as endemic for deadly yellow fever, and medical facilities in the country are limited. Australia’s Department of Foreign Affairs and Trade recommends travellers exercise a high level of caution when travelling to Sierra Leone, and notes Australia does not have an Embassy or Consulate there. Travellers are advised to contact the Australian High Commission in Ghana instead. The world’s fastest growing travel destination? According to the United Nations World Tourism Organization (UNWTO), it’s Sierra Leone. Just 24,000 people visited Sierra Leone in 2015; while UNWTO doesn’t have complete data for 2016, that is expected to reach 74,400 for 2016 once all the sums have been done (an increase of 310 per cent). Small numbers, of course (South Africa, the continent’s biggest draw, lured more than 10 million holidaymakers last year), but it’s a start. 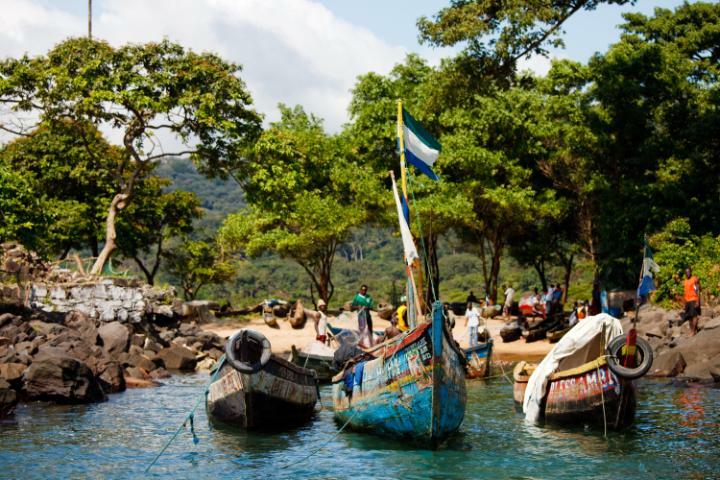 What does Sierra Leone have to offer? “Amazing beaches, idyllic villages and smiling people,” says Gunnar Garfors, who has visited every single country on Earth and rates it among his 12 favourites. It’s also an unlikely option for cycle tourism – the West Africa Cycle Challenge takes riders from Bo, Sierra Leone, to Monrovia, Liberia, raising money for the charity Street Child along the way.